Human factors can be a tricky topic that creates confusion, especially when it comes to medical devices. On today’s episode, we have Mike Drues, president of Vascular Sciences, to help us dive deeper into nuances of human factors. The root cause for human factors related to medical devices is the watershed moment with infusion pumps that happened about 10 years ago. Did you know that infusion pumps are one of the most often recalled medical devices for safety reasons? This has led to rigorous testing for all medical devices. But despite lessons learned, infusion pumps are still being recalled today. Where human factors testing requirements come from. The importance of being proactive, observing, and learning when researching medical device issues. Why the lines between a clinical trial and usability/human factor study are blurry. Whether to require users to read instructions before using a product or participating in a study. The two steps needed to create a human factors/usability study. Human factor testing differences for devices used by medical professionals vs. patients. Human factors required after going to market. Combination products are popular, but deconstruct a product’s components to identify usability issues and understand the intent of regulations. Jon Speer: Human factors. 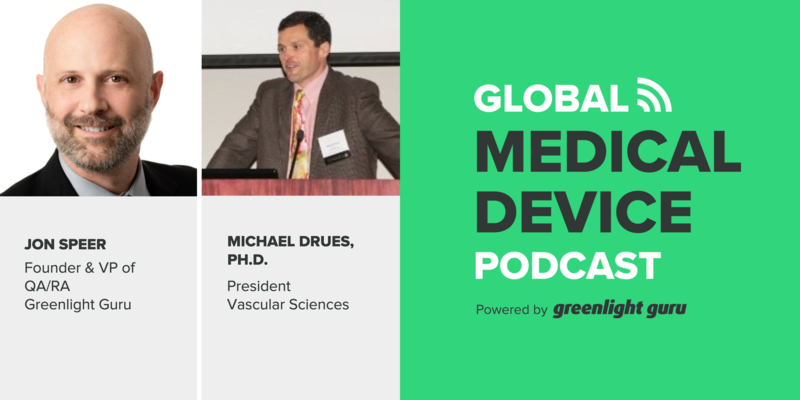 Yes, it can be a tricky topic, and one that can create some confusion, and that's why on this episode of the Global Medical Device podcast, Mike Drues from Vascular Sciences and I take a deeper dive into some nuances of human factors. 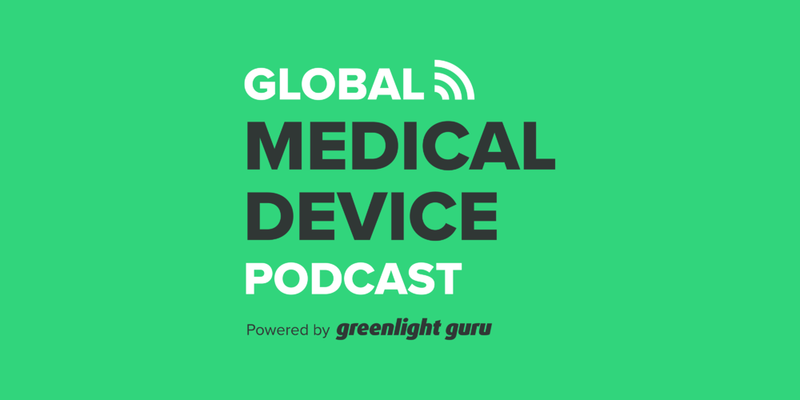 Hello, and welcome to the Global Medical Device podcast. This is your host, the founder and VP of quality and regulatory at www.greenlight.Guru, Jon Speer, coming to you from the wonderful Greenlight Guru studio in the beautiful Indianapolis, Indiana. Today, we've talked a lot about topics that are important and relevant and timely, that's what we try to do on the podcast. One of the topics, I'm just gonna confess, creates a lot of confusion, I hear a lot of comments, a lot of discussion on this, is this topic of human factors. And yes, we've done a few other pieces here and there content-wise, webinar-wise, but today I've got Mike Drues from Vascular Sciences, and we're gonna do a deeper dive into human factors testing. So Mike, welcome. Mike Drues: Thank you, Jon. Always a pleasure to speak with you and your audience. Jon Speer: You and I have talked quite a few times. There's this Venn diagram, so to speak, between design controls and risk and human factors, and clinicals, and this and that. I think we'll get into a bit of that today, but why don't we just start right away. Where did this topic of human factors testing requirements, where did it even come from? Mike Drues: That's a great question, Jon, and thanks for the opportunity to take a deeper dive, because we both hear lots of people talking about human factors testing, but really they talk about the most simplistic things, and there are a lot of much more significant issues that I think we as an industry need to understand in order to deal with. One of them is, where did this idea of human factors testing requirements come from? Because, as you remember, Jon, more than about a decade or so ago, it was pretty uncommon for medical device companies to do this kind of testing, and it was absolutely not required or expected by the FDA. The root cause of all the human factors testing that we're doing today, the precipitating event if you will, is the infusion pump fiasco that happened about a decade ago now. Long story short, infusion pumps have been one of the most recalled medical devices in the last decade. The FDA received some 56,000 reports of adverse events linked to infusion pumps. Those led to about 87 infusion pumps that were recalled in the United States for safety reasons. This all resulted in obviously more rigorous usability testing requirements for medical devices across the board. Another way to think about it, Jon, is the FDA has only put out six guidances in the area of human factors testing. Interestingly enough, five of the six guidances have come out in the last two years, since 2016. This is a relatively recent phenomenon. Now don't get me wrong, I think all companies should have a responsibility, just basic engineering, to do human factor or usability or ergonomic testing on their devices. There's no question about it. But this is one of those situations where unfortunately, there were devices out there that led to problems, and this is where all of this came from. Kind of like the breast implant fiasco that led to the biocompatibility testing. It's one of these watershed moments in the history of the medical device industry. Jon Speer: Yeah, it's really interesting fact that six of FDA's guidances on human factors, that five of them have been since 2016, even though this issue happened more than a decade ago. That's an interesting thing. Clearly, I'm speculating of course here, that even though this issue surfaced and came to a precipice some years ago on the topic of human factors, which led to that first guidance document, it's hyperbole a bit, but my observation is whenever you see increased guidance in an area, it's a subtle way, or maybe a not so subtle way of FDA and other regulatory bodies saying, "Hey, you guys aren't getting it. Here's more guidance for you." But that's a whole different topic. Mike Drues: Not to be overly negative, Jon, but it's actually even a little worse because in spite of all of these changes and lessons to be learned, and all of these guidances that have come out in the last several years, infusion pumps continue to generate a substantial portion of class one recalls, even today. I would like to think that we as an industry have really learned and improved, but unfortunately there is still an awful lot of learning and improving that needs to be done. Jon Speer: I'll go down the rabbit hole just a bit further, but infusion pump issues have also created some other required practices from companies that are in that space, in the areas of use cases for risk management, and all that sort of thing. There are other segments of the medical device industry that should take a moment to look at the infusion pump segment of the industry and glean some lessons. They talk about being proactive, reactive, that sort of thing, in previous conversations. This is one of those opportunities, folks, where you can be proactive and see what's happening in this particular device segment, observe, learn, and maybe apply some lessons learned to what you're doing. Alright, so let's continue on this. Mike Drues: You're exactly right, Jon. Sorry, just one last point. You're exactly right. One of my frustrations with some folks in this industry is that people tend to take a pretty myopic view of the universe. In other words, of course probably only a small fraction of our audience actually works on infusion pumps, so some people listening to our conversation might be thinking, "Gee, I'm working on a catheter or a hip implant or something else. Why the heck do I need to know something about infusion pumps?" Well, those who forget their history are doomed to repeat it. There's an awful lot of similarities here that apply to medical devices across the board. We really do need to take a bigger-picture view, a more holistic view, in order to truly improve that we're doing. Jon Speer: Yeah, for sure. Well, let's continue our journey into this deeper dive of human factors testing. I think there's certainly a confusion point for a lot of folks. Some people misunderstand or maybe misapply what a clinic trial is, versus a usability study. Are these the same thing? Are these different things? Maybe share a bit of thoughts about where they're the same and where they're different. Mike Drues: It's a great question, Jon. You're right, in the past, there has been a big difference between a clinical trial versus a human factor or a usability study. Nowadays, the lines are becoming blurrier and blurrier all the time. In fact in some cases, the human factor study and the clinical study is one and the same. Here's the way I like to differentiate between the two. A clinical trial focuses on the patient, whereas the usability study focuses on the user. To use, for example, a simple surgical instrument as a metaphor, a scalpel. If we were going to do a clinical trial on the scalpel, the focus would be is the scalpel able to cut through the tissue without causing excessive trauma or bleeding? If we were going to do a usability study on that same scalpel, that would focus on the surgeon's ability to use the device. In other words, does it fit well into his or her hand? Are they able to manipulate it in order to meet the objectives, the high-level labeling, the intended use and being able to cut through certain kinds of tissue without being overly traumatic, and so on. That's been the differentiator in the past. The clinical trial focuses on the patient, whereas the usability study focuses on the user. Jon Speer: Okay, that's a good distinction. There are times when the end user and that patient may be the same thing, for sure. I mean, there's a lot of products and home use products, wearables, all these sorts of things start to really blur the line, or maybe fuse the user and the patient as really being one and the same. Mike Drues: You're exactly right, Jon. Those lines are becoming more and more blurry all the time, because as you and I have talked about in the past, we have more and more devices on the market and under development where the user and the patient is, in fact, one and the same. I purposely chose the scalpel as a metaphor to illustrate historically the difference between the clinical trial and the usability study. Obviously, that metaphor is not really appropriate here because most people are not gonna use a scalpel to do surgery on themselves. But there are a litany of medical devices where the user and the patient is the same, and in that particular case, the usability study and the clinical trial is one and the same. As a matter of fact, I have several medical device companies that I work with that really do not like to talk about doing a clinical trial, although they are doing a human factor study. I often say to them, "Well, since your device is going to be used by the actual patient on themselves, or perhaps by a caregiver, isn't this really a clinical trial?" Shakespeare said, "A rose by any other name still smells as sweet." Bottom line, the lines here are becoming more fuzzy all the time. Jon Speer: Yeah, for sure. I think you'll get a kick out of this next thing I'm gonna ask you. I know you well enough to know that you have a strong opinion about things like instructions for use, directions for use, user manuals, whatever you want to call that. I've heard stories of a lot of companies when they do usability and human factor studies, one of the steps in that study is for the operator or the user to read the DFU as part of human factor studies. It's a bit of a...I know you have a strong opinion about this. What do you think about that scenario? Mike, I want you to do a human factor study. I want you to be a participant in that, you're one of my users. But before you use my product, I need you to read the manual. Mike Drues: Well, Jon, you do know me fairly well. I do have a strong opinion, but I would also say I have a realistic opinion, because I hope the vast majority of people in this industry would admit that when a physician or a nurse or even a patient takes one of our medical devices out of the box, one of the very first things they do is take that directions for use, that DFU, and simply throw it in the trash. The same thing happens in the drug world with package inserts as well. Yes, I have a strong opinion, but it is in my opinion a realistic one. Let me share with you, Jon, a scenario that I had not long ago. I was invited to speak at a conference and coincidentally, the person speaking just before me was describing a usability study. She was discussion the inclusion and exclusion criteria of that study, which is by the way, right out of the clinical trial world right back to usability study versus clinical trial. Anyway, she was describing the inclusion and exclusion criteria, and she said that one of the inclusion exclusion criteria in their study was that the surgeon, this happened to be the surgical device, had to read the DFU before they used the device. I wanted to ask her a question during this conference because I wanted to facilitate a discussion here, I said, "You realize that now you have totally invalidated your whole usability study, because we all know that the vast majority people do not do that." She basically said, 'Yes, Mike, you're correct, however it passed muster at the FDA." Jon Speer: I think I was there at that time. I remember that exchange. It was interesting, that response. It was like, we're not doing things to check a box, folks. We gotta get out of this being blind as far as what we're doing. Passing muster with FDA, I mean good for you. But did you really prove that your product is usable? Did you really do a good job of human factors with that scenario? Mike Drues: That's exactly right, Jon. This begs the question, what good is doing a test whether it's a human factor study or anything else, if it's not realistic of the real world? And regrettably, a lot of the testing that we do is not realistic of the real world. So speaking of real world ... because unlike some of my regulatory friends who seem to live in the theoretical world where people read and follow labeling instructions, I live in the real world. So here's my advice based on my real-world experience. If you're going to design a human factor study, it's actually incredibly simple. It's only two steps. Step number one, give the user your device. And step number two, shut up. Don't say anything. Don't do anything. Just simply watch what it is that they do. And if one of the things they do is take your device and take the DFU out of the package and throw it right in the trash, then note that down. By the way, you and I have talked many times about the risk mitigation strategy. If they toss the DFU into the trash, you should automatically include that in your risk mitigation strategy. One of the risks that you should consider is what if they don't read the instructions? I don't know about you, Jon, but I've not seen too many risk mitigation strategies or risk management plans where people explicitly say, "What is the risk if the person does not read the DFU?" Jon Speer: In fact, I think quite the opposite. I've seen a lot of people shove the risk mitigation and say, "We're going to put that in the DFU. We're going to put that on the label." And folks, this is ... the topic of risk, we're starting to see there's obviously a relationship between design controls and risk even more so as we go into this deeper dive of human factors. But risk is one of those things that is ... This particular topic has been very much contested and debated and discussed in a lot of other circles, but putting something in a DFU as a risk control as a risk mitigation, 999 times out of 1,000 is a poor idea. That's not an effective mitigation. Mike Drues: I could not agree more, Jon, and this is one of the reasons why although I don't completely agree with their opinion on this ... But this is one of the reasons why the ISO says that labeling should not be your primary means of mitigating risk. I don't go quite so far. But anyway, the point is that one of the reasons why ISO is making that recommendation is because, as I said, we all know that most people don't read it. Jon Speer: That's exactly right. So let's continue on our journey on this deeper dive. There's obviously products that we're developing sometimes are used by trained medical professionals, surgeons, anesthesiologists, what have you, and then as we mentioned a moment ago, sometimes there are products that we're developing that are used by patients, possibly even in a patient's home. So how does our human factor testing differ for these devices that may be used by trained professionals versus the layperson and the common everyday human being? Mike Drues: Well, Jon, that's a great question. Regrettably, at least from a regulatory perspective, there is not much of a difference between those two scenarios: devices used by a trained profession, professionally a surgeon or a physician or a nurse, versus a layperson in their home or somewhere else. As a matter of fact, of those guidances that I mentioned earlier, there is really very, very little differentiation between those two scenarios. But I've said many, many times that although human factor testing is important for medical devices across the broad, it's even more important for devices that are going to be used by a layperson as opposed to a trained medical professional. And the logic of that should be fairly obvious. A physician or a surgeon presumably graduate medical school and knows how to use that particular device or has experience with similar devices. By the way, not to be facetious but I mention that purposely that we're assuming that they have graduated medical school and they know what they're doing. I used to teach medical school myself back in the day, and I was constantly reminded of the old joke, what do you call the person that graduates last in their class in medical school? Doctor. That's right. But the same thing can be said for engineers and attorneys and for regulatory professionals as well. So bottom line, I think that we have to be even more cautious in terms of our usability for products that are going to be used by a lay user even though this detail is not specified in the guidance. Jon Speer: Well, it's ironic a little bit because engineers are largely the resource that is the most involved in a product design process, and like you, I am an engineer. I go to the counseling sessions every week for my engineering ... Kind of an engineering joke. Some of you may get that. But anyway, I don't read the directions. Jon Speer: Yeah, I don't read the directions either whenever I purchase something that requires some assembly. And it's ironic if I as an engineer designing a medical device say, "Well, we'll just put that in the instructions," when I know deep down people aren't going to read that because I don't read it. So engineer, here's a tip: imagine that you're the person using the product. You've got to separate yourself a little bit because obviously you have a strong bias. You designed the product. Of course you know how it works, but maybe you give it to one of your engineering peers who maybe is a little less involved or a little less experienced with the thing that you're developing. Hand them the DFU and watch them kind of look at it and then toss it to the side to try to figure it out. There's a lot of things you can do from a usability standpoint before you involve patients and end users. And there's a lot of things that you should do from a usability standpoint long before you put your product in the end user's hands. Keep that in mind. Mike, there's a thing that always confuses people and it's around sample size. How many products do I need to do for this? And how many samples do I need for this test and that test? And the human factors areas is certainly one of those areas as well. Human factors guidance talks about an N of 15, so where in the world did this come from? Mike Drues: Well, indeed, that is a very good question, Jon. While I do give kudos to FDA for putting a suggested number in there, I think overall it's causing more confusion or perhaps even more damage than it's solving. And the reason is, a lot of people don't ask that question of where did that 15 come from? Simply put, it's just a number. There's nothing special about it. The short answer to every question in regulatory affairs, Jon, as you know is, it depends. It depends on your technology. It depends on how new or how well established it is, how similar it is to other devices. It depends on the risk. It depends on a number of different things, so in some cases, the sample size might be much larger than 15. In other cases, it might even be smaller than 15. I've gone into the FDA and successfully argued that in this particular case maybe using only five users would suffice. As long as we have a good understanding of the range of variability, then that's what's most important. To make a comparison back to clinical trials that we talked about before, there's tons and tons of guidance about clinical trials, but you'll never see a number in there, "A suggested number of patients is X." It just simply doesn't exist. So I find it interesting that in the human factors world, we use this N equals 15 almost as gospel, almost as coming from a higher power. But in the clinical trial world, we don't. Jon Speer: Yeah, I know. It is interesting, that sample size thing. So folks, the nugget here is use that as sort of a guide so to speak. It is guidance, but whatever your sample size that you're proposing, you need to have a rational, a justification, an explanation to corroborate that that total number in your human factors testing, that that's appropriate. So do support that with the appropriate rationale. Mike Drues: You're exactly right, Jon. This is another one of these examples where the number that you choose really does not matter at all because whether you choose 5 or 15 or 150, somebody can criticize you for it. And as you and I have talked about before, Jon, FDA's most important job when they're doing their job ... They don't always do their job. But their most important job is to be critical of everything. So if we come in to the FDA as a company and we say the sky is blue, their job is to say, "Okay, prove it." And then our job is to actually prove it. If we say that we're going to use 5 or 15 or 150 or whatever the number is, it's our responsibility to say, "Here's the number we're using, and more importantly, this is why we're using this number as opposed to some other number." Jon Speer: All right. We're chugging right along, folks. I've got Mike Drues, president of Vascular Sciences joining me today, and we're doing a deeper dive on human factors testing and what that all means to you. We've got a few more topics that we're going to dive into today, but I do want to remind you all that if this is something that you're interested in and you want to learn more about it, be sure to reach out to Mike Drues of Vascular Sciences if you want to understand how human factors and design controls and risk, how to manage that and do so in a simply, easy way. I would encourage you to visit www.greenlight.guru, learn more about the Greenlight Guru go platform and how this could help you with your medical device product development activities. So Mike, continuing on, final human factors testing. What does that mean? And does it have to be done on a "final device"? Mike Drues: Well, Jon, that's a great question, and it's a question right out of the design controls. As you and I have talked about before, we are supposed to at least theoretically do our final testing on our final device. But the reality is that doesn't always happen. As a matter of fact, many times it does not happen. And so the short answer is, no we do not have to do final testing, including HF testing on our "final device." However, if that's going to be our strategy, then we have to be able to be prepared to justify any differences between the device that we do our final testing on and the actual final device itself. And we have to be able to explain why any of those differences won't impact the testing that we did. In other words, if we were to repeat final HF testing on our final device, we would see no difference. Sometimes that's easy to do. Other times, that's not easy to do. So I think if it's possible to do our final testing on our final device, then obviously, we should do it. But sometimes it's not possible, and I've seen many situations ... I'm involved with a company right now. They're working actually on a combination product, and they want to do the final HF testing on a hand-assembled version of the device ... the combination product, rather ... because the final product is going to be assembled via an automated manufacturing system. But they don't have the money ... They don't have the resources to develop that automated system prior to getting this out to the market. So we can certainly do that, but once again, we have to be able to show that the difference between, in this case, our hand-assembled product and our automated-assembled product is not significant. Jon Speer: Yeah, and that's a key thing. Sometimes our plan for mass manufacturing of our product might be a little bit different than what we're doing during the design and development process. And if those differences matter, like if I'm going to build something by hand versus automate the manufacturing when I go to market, those differences matter in that product. And you're answering your own question. You probably need to consider doing human factors on the more final device. But if they don't and you can explain why with strong rationale, then maybe they don't matter. So just keep that in mind. This is all about critical thinking. This is all about making clear explanations. Don't just do this in your head, remember that you may not look at this for another six months, and you're going to come back to this one day and go, why did we do this? Jon Speer: Mike I always said it's not a function of age, it's because of how busy I am, but I think you might be right, it could be an age factor in there too. Alright, let's continue on our journey. As you can probably tell folks we are moving through the development process and now we're getting closer to that point in time where we're getting ready to go to market with our product. What are the human factor requirements for post market surveillance, specifically for things like 510(k) or De Novo devices, is this something that's required? And if not should it be? Mike Drues: That's another terrific question Jon here, in the United States anyway, according to current regulation it's very vague. This is in fact one of the things that is changing in the Eu with the new MDR's going into affect even as we speak. The EU is expecting to see more close market surveillance data, whether it's clinical data or human factor data, even for lower risk in the U.S. equivalence of class one or class two devices. Which I think over all is a good thing, even though some companies would argue it's more burdensome to them. I think it's a good thing because we do have an obligations, it's not a regulatory one, certainly a professional one, or maybe even an ethical one, to keep an eye on our products after their cleared or approved and being used on the market. Here in the United states there are not rigorous or well defined closed market surveillance requirements, specifically with regard to human factor testing. I would arguing that in a indirect way we basically have to do that anyway, because as we've talked about before Jon if there are problems with medical device that lead to recalls or something like that. As part of the investigation we should try to tease out the root cause, and if the root cause is user error, usability in some fashion then we would find out about it that way. Simply put Jon my recommendation is regardless of geography, regardless if we happen to be doing business here in the United States or the EU or some other place in the world. I really think that we as a responsible manufacturer have a responsibility to keep an eye on our products even after their approved and on the market. Including usability. Jon Speer: Yeah, for sure, very important that we always keep our finger on the pulse and we understand what's happening with our products. Mike let's wrap up our conversation on the deeper dive into human factors today. Folks there's so much more as you can tell just by the depth of this conversation so far today there's a lot of different parts and pieces to this and we may explore this in future pod casts, future topics, and content and all that sort of thing. Let's wrap it up with this last topic today because I know there are a lot of companies that are dealing with combination products, whether they be pharmaceutical companies who are brand new to Medical Device or device companies who're doing different types of combination products. This is definitely a hot area of the device tech[inaudible 00:34:35]. What are some of... maybe you could talk about a few of the challenges from a human factor's perspective for people who are developing a manufacturing combination products. Mike Drues: Well once again Jon, that's a terrific topic to dive into a little bit further. As you and perhaps some of your audience knows I've been working in combination products for more than 20 years, longer than most people even heard that phrase. Help Canada hired me several years ago to help them develop their official Canadian policy tour combination product. This is an area where I really do know something about, although there has been guidance specifically coming out on usability or human factors for combination products. In my opinion it's really not necessary because there's nothing unique to combination products, certainly from a usability perspective. My best advice, and this is sort of combination products 101 to me, is to simply deconstruct the products. In other words, if you're working on a drug device combination product, deconstruct the product. Look at the device component by itself, look at the drug component by itself, look at what are the usability issues, what are the potential harms and risk and so on for each individual component. Then don't stop there, then you have to combine them, and look at the usability and risks of the entire system once we combine them together. Once again Jon, this should not sound unfamiliar to you or your audience. This idea is right out of the design controls, the design controls when it comes to validation, reminds us that we need to validate the product and we have to validate the process, how we make it. The design controls fall short, in my opinion, they don't remind people to validate the product and the process together. So, this is another one of those examples where people say we need more guidance, we need more regulation. I don't think that's the solution, I think we have plenty of regulation, maybe even too much. What I think is, we need people understanding the intent of the regulation not taking a literal interpretation of those words, but trying to understand the intent of that regulation. Then we could apply it in lots of different situations, like for example, combination products, and one last piece of small advice for anybody in the audience working specifically in combination products. As you entered that in the beginning of these questions Jon, in the devices world specifically CDRH the device part of FDA, they have a lot of experience with usability testing on the drug and biologic side. If you're dealing with [Cedar 00:37:27] or [Seeburg 00:37:27] with all do respect to my many FDA friends, they don't have nearly as much human factors testing experience, although some of them think they do. Jon Speer: That's a really good point and this is a good way to kind of summarize as well. If you're going to wait for regulatory bodies to tell you what to do then you may not like the answer. Be proactive folks, come up with a plan for how you plan to address your human factors, that's important. I know that's so key and one of the other things that I know I'm a fan of and I know, Mike you're a big fan of too is, this is an opportunity. Before you get too deep into it and start just doing different human factors testing, this is a great opportunity to take it to FDA in advance maybe via a pre-sub. What do you think? Mike Drues: I think that's obviously excellent advice Jon, something that you and I have talked about a number of times in the past, and specifically in regard to the pre-sub. More are coming to the FDA with pre-subs for companies very early in the chronic development life cycle. As a matter of fact, in a couple of cases now we have not even had a prototype, I have literally taken a virtual product, a virtual device to the FDA in the form of a pre-sub. Perhaps that could be topic of a different discussion, but the reason I'm bringing it up here is because, at that particular point in the development cycle we probably do not have a fully developed human factor study to dine, and protocol and so on. In that case, what I usually try to provide is at least, what I call a high level executive summary, in a very high level here's what our human factor's study is going to look like. At least to give FDA a sense of what direction we're going and then we can have a conversation about it if they have any feedback. The last thing that I want to do, and I've seen many companies do this, is not bring it up. If you don't bring it up just like if you leave something out of a submission and it gets kicked back, FDA has no idea why you didn't bring it up. In other words, did you not bring it up because it's not applicable or because you simply forgot about it. One of my biggest strategies Jon, is I want to demonstrate very strongly, very candidly to my friends on the FDA side of the table that I do know what the heck that I'm doing, I am a professional, I know what all of my options are and the advantages and disadvantages, and quite frankly I have not forgotten everything. If the product is in early in the development cycle, I will say to them this product is still under development. We have not gotten to the point of a designed piece and some of the questions that you might have, we don't have answers to yet but they are definitely on our radar, they're on our list and we're going to come back to you when we get in that particular point in the road and address that. Jon Speer: Exactly, it's definitely something that you have to be aware of folks. Plan and communicate, the more that you're engaging with the FDA, and I know the old school people are like, "Oh that crazy", but I'm telling you that this is an opportunity. The best opportunity for you to be successful, is FDA is involved with your discussions and you have a good plan and you can defend your plan that's only going to help you and the success of your product in the market place. Folks I want to thank Mike, and Mike I know you're a very passionate person especially on topic regulatory related. Clearly we discovered today that you're a passionate person on human factors and you know your stuff. So folks if you have those human factors questions, wanted a little bit of guidance and direction, I do encourage you to reach out to Mike Drews with Vascular Sciences. Again this has been Jon Speer, the host and founder of VP quality and regulatory at Greenlight Guru. We're doing some pretty awesome things at Green Light as well, so be sure to go to www.GreenLight.Guru.com check out our Go product for your design control risk activities. Also take a peak at what we're doing with our Grow product for these post market activities including some of these post market surveillance to be able to monitor what's happening with your products once you launch it into the market place. Thank you once again for listening to the Global Medical Device Podcast.